For the purist strength training athletes among you, circuit weight training has no place in a well-structured strength and conditioning program. After all, if you want to get strong, surely the only way you can do so is to lift heavy – right! And you certainly can’t lift heavy weights if you are circuit training. Or can you? Well, as I have often found, when it comes to exercise science the answers aren’t always clear cut. My definition of a circuit weight training program is - a normal strength training program where the exercise protocols (set, reps and duration) are designed according to traditional circuit training methodology. Circuit strength training is therefore not the same as a traditional circuit training program, which at best is just a very effective means of developing general fitness. A traditional circuit training program is more about fitness than it is about strength. Consequently, the design of a traditional circuit training workout will usually be made up of exercises with little or no resistance (small dumbbells, medicine balls or power bags). 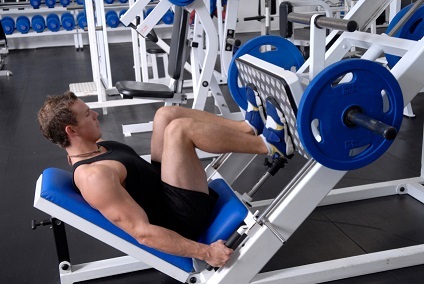 A circuit strength training session will normally comprise free or machine weights. It will utilize loads that are reasonably heavy (40 – 60% of your 1RM). By heavy, I mean heavy for you. So, even if your best squat is only 150 pounds, 60% of this load would represent 90lbs, which is far more weight than you would lift using a powerbag or dumbbell! Let’s examine a typical circuit strength training program. As I have indicated above, a training session of this type will utilize loads of up to 60% of your 1RM. The exercise duration of circuit training of this type is between 25 and 40 seconds. At a rate of one repetition every two second, you would be expected to complete between 12 and 20 repetitions in a set. So, as you can see, the intensity at which you will perform the exercise is medium, and the work rate will be high. If you set your load intensity at the 60% end of the spectrum, these are ideal conditions for reasonable muscle protein breakdown. What do I mean by muscle protein breakdown? Muscle protein breakdown refers to the microtrauma which takes place with the muscle during exercise. Microtraumas are small damage to muscles caused by exercise. Whe this happens the body respond by repairing the damaged tissue stronger than its previous state. It does so because it wants to limit the possibility of future injuries. The increase in strength usually manifest itself in larger muscle fibres. Circuit training workouts can provide the type of stress on the muscular system which elicits this response. The type and quality of strength that is developed using this training method is open to debate. For example, there are opinions which suggest that high repetition with sub-maximum loads not only increases the size of muscle fibres, but may also increase the size of the sarcoplasm (the membrane which surrounds muscle fibre). Increases to the size of the sarcoplasm can give you the appearance of good muscle size, but not necessarily the level of strength you might expect from your increased size. However, I have not come across any studies that prove or dis-prove this theory, but several prominent researchers and writers on strength training such as Russian coach and sport scientist Vladimir Zatsiorsky’s (Science and Practice of Strength Training) who suggest that hypertrophy of the sarcoplasm is a real phenomenon. This is not to say that circuit weight training is not effective for strength gains - because it is. However, it does depend on what you want to gain from your training session – maximum strength or strength endurance. The evidence suggests that the dominant quality that is developed using circuit weight training methods is strength endurance rather than maximum strength. From "Circuit Weight Training" Back To "Faster, Stronger, Better – Your Shortcut To Improved Athletic Performance"